Loneliness in humans has been understood as a discrepancy between desired and real social relations and the impact of loneliness over physical and mental health has been evaluated in many studies across the globe. Data from the Western countries suggest that although loneliness is prevalent across all age groups, it is more distinctive in the geriatric population., Based on the three-item version of the UCLA Loneliness Scale (LS) studies from Western countries have estimated the prevalence of chronic loneliness in individuals aged ≥60 years to be in the range of 11.5%–43%, It is suggested that as the age advances, elderly persons often tend to lose the active role they used to play and enter into a passive role which makes them feel insufficient and they develop a sense of alienation and a sense of losing independence and resultant loneliness.,, Available data also suggest that aging alone is not responsible for developing feelings of loneliness, rather several other factors such as gender, marital status, level of education, being employed or not or being financially stable or not, and living environment also play a significant role in the development of loneliness in elderly individuals. It is now a well-known fact that the number of elderly people living alone is increasing all over the world. This can be understood from the fact that in the United Kingdom, the government has formed a ministry for loneliness. Living alone in itself is a major source of suffering in the elderly. Studies have shown that loneliness results in increased mortality and increased morbidity in the form of presence of higher number of chronic illness, cardiovascular disease,, and impaired cognitive functions. Loneliness also significantly affects the mental health of an elderly. It leads to fear, anxiety, and depressive thinking. It increases the tendency of negative thinking, decreases self-confidence, decreases confidence on significant others, and increases the fear of being abused and secluded from the society. Such a negative state can in turn lead to the development of depression. Loneliness is also called as the “hidden killer” of the elderly. It has also been strongly linked with the development of suicidal ideations and parasuicidal behavior. Loneliness has been classified differently. Based on the various internal and external factors, three different types of loneliness has been described in the literature, namely, situational loneliness (loss of social contacts due to unexpected situations such as disasters, migration, and interpersonal conflicts), developmental loneliness (due to personal inadequacies, separation, poverty, and physical disability, etc.) and internal loneliness (due to certain personality factors, poor coping skills, low self-esteem, etc. )., Loneliness is also conceptualized as emotional loneliness and social loneliness. While emotional loneliness arises when one starts becoming aware of missing/losing of a close attachment with a significant person (spouse, siblings) of one's life, social loneliness arises when one starts feeling aware of losing network of his/her social relationships in which he/she was a part in the past. Studies have found marital status and availability of a good and supportive social network to be strong predictors of loneliness in the elderly. In this background, the present study aimed to evaluate the prevalence of loneliness and its relationship with social connectedness with depression in elderly. In addition, an attempt was made to evaluate the demographic and clinical predictors of loneliness and social connectedness in elderly patients with depression. This multicentric study was conducted under the aegis of the Indian Association for Geriatric Mental Health and was approved by all the local Institutional Ethics Committees of the institutes in which this study was conducted. All the participants were explained about the study and were recruited after obtaining written informed consent. Participants were recruited at 8 centers, details of which are already published earlier. The study followed a cross-sectional design in which participants were assessed only once. To be included in the study, patients of either gender, aged ≥60 years, fulfilling the criteria of major depressive disorder as per the Diagnostic and Statistical Manual of Mental Disorders-IV Edition criteria and confirmed by MINI Plus were recruited and those with mental retardation and those too ill to be assessed were excluded. All the patients were rated on Geriatric Depression Rating Scale (GDS-30), Generalized Anxiety disorder questionnaire (GAD-7), The Patient Health Questionnaire (PHQ-15), Columbia Suicide Severity Rating Scale (C-SSRS), UCLA LS, and Revised Social Connectedness Scale. This scale comprises 20 items, which evaluates the one's subjective feelings of loneliness as well as feelings of social isolation. These items reflect one's dissatisfaction from social relationships. The participants are required to assess each item in the scale according to how often they believe the statement is true for them on a 4-point scale, higher scores indicating more loneliness. The scale has been shown have good internal consistency (coefficient a ranging from 0.89 to 0.94), test-retest reliability (r = 0.73), and adequate convergent and construct validity. For this study, this scale was translated into Hindi. This is a 20-item scale, of which 10 are positively worded and 10 are negatively worded. The 10 positively worded items capture the experience of sense of closeness with others and maintaining and seeking connections. The negatively worded items capture one's experience of distance and isolation from others. The scale has demonstrated adequate reliability (internal reliability α = 0.91, test-retest r = 0.96) and convergent and divergent validity. Higher the score, better is the social connectedness. For this study, this scale was translated into Hindi. Data were analyzed using SPSS version 14 (SPSS for Windows, SPSS Inc., Chicago, IL, USA). Descriptive analysis involved calculation of mean and standard deviation (SD) with a range for continuous variables and frequency and percentages for ordinal or nominal variables. Chi-square test, t-test, and Mann–Whitney test were used for comparison of various variables. Pearson's correlation coefficient and Spearman's rank correlation coefficient were used to evaluate the association of loneliness and social disconnectedness with other variables. The study included 488 patients diagnosed with depression. Slightly more than half of the sample comprised of males (53.7%; n = 262), was on paid employment (53.3%, n = 260) and from urban locality (53.1%, n = 259). The mean age of the study sample was 66.55 (SD-5.83) years and the mean duration of education in years was 7.63 (SD 5.85). About one-fourth of the sample (25.4%; n = 124) were currently single (unmarried, widowed, separated, and divorced). About 70% of the sample had a nonnuclear family setup (69.9%, n = 341). Three-fifths of the sample was diagnosed with first episode depression (60.9%; n = 297) and rest were diagnosed with recurrent depressive disorder (39.1%; n = 191). More than three-fourth of the sample had at least one comorbid physical illness (78.7%, n = 384). 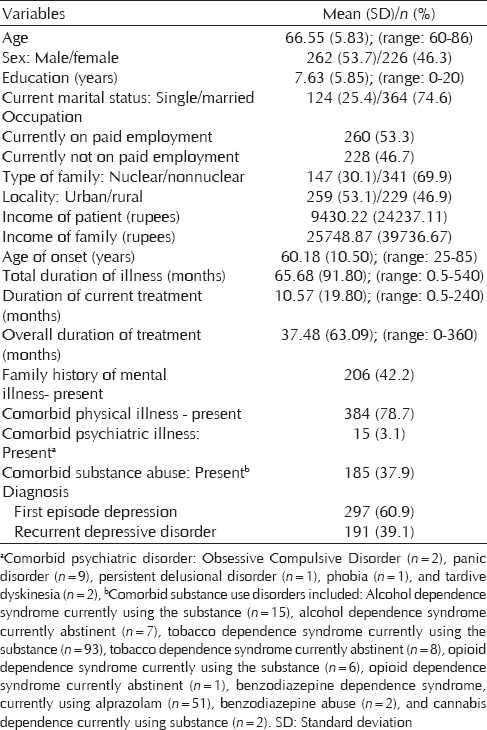 Comorbid psychiatric disorder and comorbid substance abuse were found in 3.1% and 37.9% of the study sample. The mean age of onset of depression was 60.2 (SD-10.5) years with a mean total duration of illness of 65.68 (SD-91.80) months. Family history of mental illness was found in 42.2% of the sample (42.2%, n = 206). Details are presented in [Table 1]. Mean scores on various scales are shown in [Table 2]. The mean GDS score was 16.96 (SD-24.03; range 10–30) with about one-fourth of the participants (n = 125; 25.6%) having severe depression as per GDS. The mean GAD-7 score of the sample was 9.46 (SD-4.20; range-0–21). On GAD-7, about four-fifths of the sample (81.6%) had scored ≥10, which is considered to be cutoff for diagnosis of GAD as per the GAD-7 scale. The mean total PHQ-14/15 score was 11.56 (SD-4.13; range-0–25) and about 70% of the sample had severe somatization (score >10). The mean social connectedness score of the sample was 69.87 (SD-10.20) with a range of 32–117 and the mean LS score was 27.93 (SD-13.96) with a range of 0–60. The three-item UCLA LS (lack of companionship, left out in life, and isolated from others) have been most commonly used to assess the prevalence of loneliness across many studies and responses for any of these three items in the form of “sometimes/often” are considered as indicative of the presence of loneliness. In the present study, when the same method was followed, 77.3% of the entire sample reported the presence of loneliness. With respect to specific loneliness symptom, 62.5% reported lack of companionship, 58.7% reported left out in life, and 56.5% of the individuals reported felt isolated from others. There were no gender differences noted in the prevalence of any loneliness symptom. Details are mentioned in [Table 3]. Higher loneliness scores had significant positive correlation with severity of depression, anxiety, and somatic symptoms as assessed by GDS-30, PHQ-15, and GAD-7, respectively [Table 4]. Higher social connectedness was associated with higher level of anxiety. However, no significant correlation emerged between severity of depression, somatic symptoms, and loneliness with social connectedness [Table 4]. When the association was evaluated separately for participants of either gender, as is evident from the [Table 4], loneliness had significant positive correlation with severity of depression, anxiety, and somatic symptoms across both the genders. In addition, in females, there was higher social connectedness was associated with more anxiety and lower loneliness. There was no significant difference in the social connectedness score and loneliness score between male and female participants. Similarly, employment status and locality did not have any significant relationship with social connectedness and loneliness. However, participants who were currently single reported significantly higher loneliness (single: 32.90 [12.05] vs. married: 26.23 [14.18]; t-value: 4.687 [P < 0.001***]). Higher level of loneliness was reported by participants who were older (Pearson correlation coefficient: 0.151 (P < 0.001***). In terms of type of family, participants belonging to nuclear family reported significantly higher social connectedness (nuclear: 71.84 [12.85] vs. nonnuclear: 69.03 [8.71]; t-value: 2.81 [0.005**]). Higher social connectedness was reported by participants who were more educated (Pearson correlation coefficient: 0.214 (P < 0.001***). In terms of clinical parameters, higher loneliness was reported by participants who had depressive illness for longer duration (Pearson correlation coefficient: 0.161 [P < 0.001***] and were receiving treatment for longer duration (Pearson correlation coefficient: 0.155 [P < 0.001***]). In addition, higher level of loneliness was reported by participants with positive family history of mental illness (32.30 [11.92] vs. 24.74 [SD 14.49]; t-test value: 6.124, P < 0.001), presence of comorbid physical illness (29.28 [13.16] vs. 22.94 [15.66]; t-test value: 4.177, P < 0.001***), and absence of comorbid substance use disorders (25.25 [14.23] vs. 29.56 [13.56]; t-test value: 3.33, P < 0.001***). Other clinical parameters, that is, comorbid psychiatric illness, type of depression (single vs. multiple episodes), and age of onset of depression did not have any association with loneliness. Lower social connectedness was reported by participants who were on treatment for longer duration (Pearson correlation coefficient: 0.097 (P = 0.032*), those without family history of mental illness (69.02 [11.79] vs. 71.04 [7.39]; t-test value: 2.16, P < 0.001***), and those without comorbid physical illness (67.52 [7.99] vs. 70.51 [10.65]; t-test value: 2.66, P = 0.008*). 4.164, P < 0.001***), active suicidal ideation with specific plan and intent (t-test value: 3.523, P < 0.001***), and presence of nonsuicidal behavior (t-test value: 2.326, P = 0.02*). Higher loneliness was also associated with higher intensity of suicidal ideations (Spearman's correlation coefficient: 0.223, P < 0.001***), higher number of actual attempts (Spearman's correlation coefficient: 0.230, P < 0.001***), higher number of aborted attempts (Spearman's correlation coefficient: 0.253, P < 0.001***), and higher number of total interrupted attempts (Spearman's correlation coefficient: 0.232, P < 0.001***). Social connectedness did not have any significant association with suicidal behaviors except for the fact that higher social connectedness was associated with higher number of aborted attempts (Spearman's correlation coefficient: 0.159, P < 0.001***) and presence of nonsuicidal behavior (t-value: 5.562, <0.001***). The present multicentric study which evaluated the prevalence of loneliness and its association with severity of depression and social connectedness in elderly individuals with depression shows that 77.3% of the elderly patients with depression experience loneliness. When the prevalence of loneliness is compared with the existing data, it is evident that the prevalence noted in the present study is much higher than that reported in general population studies from the developed countries, which have reported the prevalence of 11.5%–43%.,,, The high prevalence in the present study could be due to the limitation of the study sample to elderly patients with depression. The present study suggests that higher level of loneliness is associated with more severe depressive symptoms, anxiety symptoms, and somatic symptoms. Similar association between loneliness and depression has been documented in previous studies too.,,, Some of the previous studies suggest that loneliness can be a risk factor for developing depression, and it can increase the severity of depression,, and it increases the risk for suicide in the elderly., Although the present study did not evaluate the cause-effect relationship, it can be said that higher level of depression leads to loneliness and vice-versa. The present study also shows that higher loneliness is associated both with suicidal ideations and number of suicidal attempts. The present study suggests a positive and significant association between the depressive scores (as assessed on GDS-30 and PHQ-15) and loneliness scores. In addition, higher loneliness scores were significantly associated with nonspecific suicidal thoughts, active suicidal ideations with and without intent as well as with the presence of suicidal behavior. Accordingly, it can be said that, severity of depression can be reduced among elderly by avoiding loneliness. This can be done by providing social support as per the requirement. Further, the present study also suggests that clinicians evaluating elderly persons with depression must focus on the loneliness issues and try to enhance their social support. Association of loneliness with suicidal behavior also suggests the important role of improving social support of elderly, to reduce suicidal attempts in elderly with depression. While some studies have found significant gender differences in the prevalence or severity of loneliness and depression, with higher loneliness among older females,,,, but others have reported no significant differences between the two genders.,, The present study supports the second set of studies and suggests that loneliness must be given equal importance in individuals of either gender. In the present study too, there was significant association between loneliness and severity of anxiety. Very few studies have looked at the association between loneliness and anxiety symptoms in the elderly., It has been postulated that actual loss or fear of loss of interpersonal relationships/separation in the late life induces anxiety symptoms which may have several manifestations ranging from minor worry or grief to somatization/psychosomatic problems. The association of loneliness and anxiety in elderly patients with depression can also possibly explain the higher prevalence of anxiety among elderly patients with depression. Social connectedness has been found to be positively linked with a sense of subjective happiness and subsequently predicts lower loneliness and depressive symptoms. However, few studies have found no relationship between sociability/social connectedness and loneliness. The possible explanation could be feelings of loneliness does not depend only on the number of social networks but also depends upon the quality and satisfaction perceived by the individual., In the present study, surprisingly, loneliness was not associated with social connectedness among males, but the two variables had significant association among females, with lower social connectedness associated with higher level of loneliness among females. This finding can be understood from the sociocultural perspectives. Some of the studies suggest that after retirement, for persons of either gender, spousal support is the most important aspect of seeking social support. However, after spousal support, elderly men prefer to seek social support from same gender siblings and friends, whereas elderly women seek more support from their child and immediate family. Accordingly, with changing social norms, in which the younger generation is more self-absorbed, seeks more independence, elderly females possibly experience more loneliness than men, who continue to maintain their social connectedness with same age siblings and friends. The findings of the present study also suggest that higher loneliness is perceived by those, who age older and are currently single. This finding can be understood by the fact that, in elderly of either gender, spouse is possibly the most important part of their social network., Previous studies have also reported higher degree of loneliness and depression and anxiety symptoms in those who have no living children/separated from their children or living in old-age homes (commonly called as empty nest older adults).,,, Accordingly, it can be said that as the elderly age, chances of losing spouse increases further, this increases the feelings of loneliness and depression. Being married or being in a relationship has been found as a protective factor to prevent loneliness and subsequent depression across a number of studies.,,,, In the present study also, higher scores of loneliness were found in those who were currently single (widowed/divorced/unmarried) and this finding supports the existing literature. Some of the previous studies have reported association of loneliness with demographic variables such as security, occupation, locality, and income.,,, However, in the present study, no significant association was noted between some of these variables and loneliness. This difference could be due to cultural factors or limitation of the present study sample to those who were currently depressed. Accordingly, these findings must be considered as preliminary and must be replicated. The present study has certain limitations in the form of cross-sectional assessment, evaluation of clinic/hospital attending elderly population with depression. Extensive psychosocial assessment and interview to determine loneliness and social connectedness were not done and the reporting was limited to rating scales. Further, the present study design does not provide any understanding about the cause and effect relationship between depression, loneliness, and social connectedness. Strengths of the study include good sample size, recruitment of participants across multicentric centers spread across the country, and use of standardized instruments to assess depression, anxiety, loneliness, and social connectedness. The present study suggests that about three-fourth of the elderly patients with depression also have associated loneliness. Loneliness is associated with higher severity of depression, anxiety, and somatic symptoms. Severity of depression is associated with loneliness but not with social connectedness. Lower social connectedness among elderly females with depression is associated with higher loneliness, but this is not true for elderly males with depression. Peplau L, Perlman D, editors. Perspectives on loneliness. In: Loneliness: A Source Book of Current Theory, Research and Therapy. New York: Wiley; 1982. p. 1-20. Rico-Uribe LA, Caballero FF, Olaya B, Tobiasz-Adamczyk B, Koskinen S, Leonardi M, et al. Loneliness, social networks, and health: A cross-sectional study in three countries. PLoS One 2016;11:e0145264. Krause N. Stress and isolation from close ties in later life. J Gerontol 1991;46:S183-94. Donaldson JM, Watson R. Loneliness in elderly people: An important area for nursing research. J Adv Nurs 1996;24:952-9. Yang K, Victor C. Age and loneliness in 25 European nations. Ageing Soc 2011;31:1368-88. Loboprabhu S, Molinari V. Severe loneliness in community-dwelling aging adults with mental illness. J Psychiatr Pract 2012;18:20-8. Prince MJ, Harwood RH, Blizard RA, Thomas A, Mann AH. Social support deficits, loneliness and life events as risk factors for depression in old age. The gospel oak project VI. Psychol Med 1997;27:323-32. Rokach A. Loneliness and the life cycle. Psychol Rep 2000;86:629-42. Jylhä M. Old age and loneliness: Cross-sectional and longitudinal analyses in the Tampere longitudinal study on aging. Can J Aging 2004;23:157-68. Cohen-Mansfield J, Shmotkin D, Goldberg S. Loneliness in old age: Longitudinal changes and their determinants in an Israeli sample. Int Psychogeriatr 2009;21:1160-70. Suzman R, Beard JR, Boerma T, Chatterji S. Health in an ageing world – What do we know? Lancet 2015;385:484-6. Yeginsu C. U.K. Appoints a Minister for Loneliness. The New York Times; 2018. Available from: https://www.nytimes.com/2018/01/17/world/europe/uk-britain-loneliness.html. [Last accessed on 2018 Jun 18]. Luanaigh CO, Lawlor BA. Loneliness and the health of older people. Int J Geriatr Psychiatry 2008;23:1213-21. Luo Y, Hawkley LC, Waite LJ, Cacioppo JT. Loneliness, health, and mortality in old age: A national longitudinal study. Soc Sci Med 2012;74:907-14. Theeke LA. Sociodemographic and health-related risks for loneliness and outcome differences by loneliness status in a sample of U.S. older adults. Res Gerontol Nurs 2010;3:113-25. Sorkin D, Rook KS, Lu JL. Loneliness, lack of emotional support, lack of companionship, and the likelihood of having a heart condition in an elderly sample. Ann Behav Med 2002;24:290-8. Thurston RC, Kubzansky LD. Women, loneliness, and incident coronary heart disease. Psychosom Med 2009;71:836-42. Tzang RF, Yang AC, Yeh HL, Liu ME, Tsai SJ. Association of depression and loneliness with specific cognitive performance in non-demented elderly males. Med Sci Monit 2015;21:100-4. Reynolds CF, Zubenko GS, Pollock BG, Mulsant BH, Schulz R, Mintun MA, et al. Depression in late life. Curr Opin Psychiatry 1994;7:18. Stravynski A, Boyer R. Loneliness in relation to suicide ideation and parasuicide: A population-wide study. Suicide Life Threat Behav 2001;31:32-40. Weiss R. Loneliness: The Experience of Emotional and Social Isolation. Cambridge: MIT Press; 1973. Tiwari SC. Loneliness: A disease? Indian J Psychiatry 2013;55:320-2. Green LR, Richardson DS, Lago T, Schatten-Jones EC. Network correlates of social and emotional loneliness in young and older adults. Pers Soc Psychol Bull 2001;27:281-8. Cacioppo JT, Hughes ME, Waite LJ, Hawkley LC, Thisted RA. Loneliness as a specific risk factor for depressive symptoms: Cross-sectional and longitudinal analyses. Psychol Aging 2006;21:140-51. Cacioppo JT, Hawkley LC, Thisted RA. Perceived social isolation makes me sad: 5-year cross-lagged analyses of loneliness and depressive symptomatology in the Chicago health, aging, and social relations study. Psychol Aging 2010;25:453-63. Dahlberg L, Andersson L, McKee KJ, Lennartsson C. Predictors of loneliness among older women and men in Sweden: A national longitudinal study. Aging Ment Health 2015;19:409-17. Santini ZI, Fiori KL, Feeney J, Tyrovolas S, Haro JM, Koyanagi A, et al. Social relationships, loneliness, and mental health among older men and women in Ireland: A prospective community-based study. J Affect Disord 2016;204:59-69. Houtjes W, van Meijel B, van de Ven PM, Deeg D, van Tilburg T, Beekman A, et al. The impact of an unfavorable depression course on network size and loneliness in older people: A longitudinal study in the community. Int J Geriatr Psychiatry 2014;29:1010-7. Aylaz R, Aktürk Ü, Erci B, Öztürk H, Aslan H. Relationship between depression and loneliness in elderly and examination of influential factors. Arch Gerontol Geriatr 2012;55:548-54. Domènech-Abella J, Lara E, Rubio-Valera M, Olaya B, Moneta MV, Rico-Uribe LA, et al. Loneliness and depression in the elderly: The role of social network. Soc Psychiatry Psychiatr Epidemiol 2017;52:381-90. Singh A, Misra N. Loneliness, depression and sociability in old age. Ind Psychiatry J 2009;18:51-5. Desai R, Abraham D, Harshe D, Ramakrishnan A, Cholera R, Kale S. A study of depression, perceived loneliness, cognitive function and independence in daily activities in home and institution based older people: A cross sectional comparative study. J Geriatr Ment Health 2016;3:140-4. Grover S, Avasthi A, Sahoo S, Lakdawala B, Nebhinani N, Dan A, et al. IAGMH multicentric study on depression in elderly: Symptom profile and influence of gender, age of onset, age at presentation and number of episodes on symptom profile. J Geriatr Ment Health 2018;5:35-48. Russell D, Peplau LA, Cutrona CE. The revised UCLA loneliness scale: Concurrent and discriminant validity evidence. J Pers Soc Psychol 1980;39:472-80. Russell DW. UCLA loneliness scale (Version 3): Reliability, validity, and factor structure. J Pers Assess 1996;66:20-40. Lee RM, Draper M, Lee S. Social connectedness, dysfunctional interpersonal behaviors, and psychological distress: Testing a mediator model. J Couns Psychol 2001;48:310-8. Mundt JC, Greist JH, Jefferson JW, Federico M, Mann JJ, Posner K, et al. 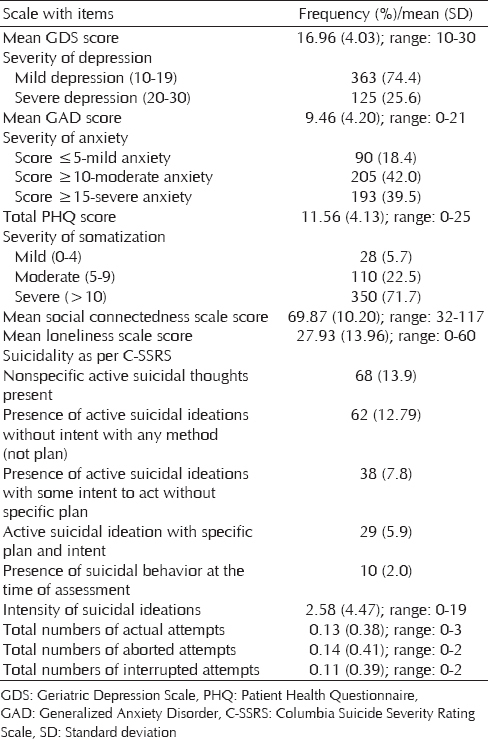 Prediction of suicidal behavior in clinical research by lifetime suicidal ideation and behavior ascertained by the electronic Columbia-suicide severity rating scale. J Clin Psychiatry 2013;74:887-93. Simon MA, Chang ES, Zhang M, Ruan J, Dong X. The prevalence of loneliness among U.S. Chinese older adults. J Aging Health 2014;26:1172-88. Gerst-Emerson K, Shovali TE, Markides KS. Loneliness among very old Mexican Americans: Findings from the Hispanic established populations epidemiologic studies of the elderly. Arch Gerontol Geriatr 2014;59:145-9. Goretti S, Sanchéz Sanchéz MD, Góngora Oliver B, Sanz Fernández MD. Risk of suicidal behaviours in elderly. Eur Psychiatry 2017;41:S652. Arber S, Ginn J. Gender and Later Life. London: Sage; 1991. Beal C. Loneliness in older women: A review of the literature. Issues Ment Health Nurs 2006;27:795-813. Zebhauser A, Hofmann-Xu L, Baumert J, Häfner S, Lacruz ME, Emeny RT, et al. How much does it hurt to be lonely? Mental and physical differences between older men and women in the KORA-age study. Int J Geriatr Psychiatry 2014;29:245-52. Khademi MJ, Rashedi V, Sajadi S, Gheshlaghi SM. Anxiety and loneliness in the Iranian older adults. Int J Psychol Behav Sci 2015;5:49-52.
de Beurs E, Beekman AT, Deeg DJ, Van Dyck R, van Tilburg W. Predictors of change in anxiety symptoms of older persons: Results from the longitudinal aging study Amsterdam. Psychol Med 2000;30:515-27. Satici SA, Uysal R, Deniz ME. Linking social connectedness to loneliness: The mediating role of subjective happiness. Pers Individ Differ 2016;97:306-10. Revenson T, Revenson TA. Predictable Loneliness of Old Age: Dispelling the Myth. Paper Presented in the Annual Convention of American Psychological Association. Washington DC; 1982. Mathur S. Social support network analysis of the elderly: Gender differences. Int J Hum Soc Sci Stud 2015;2:168-75. Caetano SC, Silva CM, Vettore MV. Gender differences in the association of perceived social support and social network with self-rated health status among older adults: A population-based study in Brazil. BMC Geriatr 2013;13:122. Wang G, Hu M, Xiao SY, Zhou L. Loneliness and depression among rural empty-nest elderly adults in Liuyang, China: A cross-sectional study. BMJ Open 2017;7:e016091. Wang J, Mann F, Lloyd-Evans B, Ma R, Johnson S. Associations between loneliness and perceived social support and outcomes of mental health problems: A systematic review. BMC Psychiatry 2018;18:156. Wang Z, Shu D, Dong B, Luo L, Hao Q. Anxiety disorders and its risk factors among the Sichuan empty-nest older adults: A cross-sectional study. Arch Gerontol Geriatr 2013;56:298-302. Cheng P, Jin Y, Sun H, Tang Z, Zhang C, Chen Y, et al. Disparities in prevalence and risk indicators of loneliness between rural empty nest and non-empty nest older adults in Chizhou, China. Geriatr Gerontol Int 2015;15:356-64. Gale CR, Westbury L, Cooper C. Social isolation and loneliness as risk factors for the progression of frailty: The English longitudinal study of ageing. Age Ageing 2018;47:392-7. Kvaal K, Halding AG, Kvigne K. Social provision and loneliness among older people suffering from chronic physical illness. A mixed-methods approach. Scand J Caring Sci 2014;28:104-11. Holt-Lunstad J, Smith TB, Baker M, Harris T, Stephenson D. Loneliness and social isolation as risk factors for mortality: A meta-analytic review. Perspect Psychol Sci 2015;10:227-37. Holwerda TJ, Beekman AT, Deeg DJ, Stek ML, van Tilburg TG, Visser PJ, et al. Increased risk of mortality associated with social isolation in older men: Only when feeling lonely? Results from the Amsterdam study of the elderly (AMSTEL). Psychol Med 2012;42:843-53. Tabue Teguo M, Simo-Tabue N, Stoykova R, Meillon C, Cogne M, Amiéva H, et al. Feelings of loneliness and living alone as predictors of mortality in the elderly: The PAQUID study. Psychosom Med 2016;78:904-9. Arling G. The elderly widow and her family, neighbors and friends. J Marriage Fam 1976;38:757-68.
de Azeredo ZA, Afonso MA, de Azeredo ZA, Afonso MA. Loneliness from the perspective of the elderly. Rev Bras Geriatr Gerontol 2016;19:313-24. Beutel ME, Klein EM, Brähler E, Reiner I, Jünger C, Michal M, et al. Loneliness in the general population: Prevalence, determinants and relations to mental health. BMC Psychiatry 2017;17:97. Grenade L, Boldy D. Social isolation and loneliness among older people: Issues and future challenges in community and residential settings. Aust Health Rev 2008;32:468-78. Sundström G, Fransson E, Malmberg B, Davey A. Loneliness among older Europeans. Eur J Ageing 2009;6:267.